I very much wanted to see Fantastic Mr Fox when it was in cinemas, but somehow it slipped by without my managing to get my bum in a seat. And then it wasn't until five years later, after having seen director Wes Anderson's latest - The Grand Budapest Hotel - that I remembered I wanted to watch it and finally got hold of a copy. And this is exactly the sort of film I'd expect the maker of that film to make for children. Highly idiosyncratic, understated, oddly-paced and thoroughly modern, it may be irreverent to Roald Dahl but it is also a wonderful tangent for an auteur to go off on given a strong starting point. And if, somehow, you didn't notice the fixation with the centre line and how symmetry can draw attention to it in The Grand Budapest Hotel, I'd certainly hope you'd see it here. I mentioned Dahl, and indeed, this was one of the books I read in my childhood. I can't say that I ranked it as one of my favourites, though - it was no BFG, or Matilda, or either of the Charlie books. There's not much of an emotional arc to the book, though it had Dahl's trademark nasty streak, which is largely replaced here with the theme of how awkward communication can be that Anderson seems to very much enjoy. Other than that, really, what Anderson takes from Dahl is the setting - fox vs three nasty farmers - the symbol of contrition that is a tail being cut off and, in a way, the ending. What comes in the middle is all Anderson, and even more than a highly disciplined mise-en-scene, what seems to be his calling card is glib, naturalistic dialogue in which people often don't really listen to each other and often want to talk about their problems in a way that makes other uncomfortable. Very distinctive - and very bizarre to see in an animated film, which is partly what makes this so enjoyable. Somehow, there's just a slight edge of absurdity added to an awkward young boy who thinks he can't live up to his father's expectations feeling upstaged by the taller, more athletic cousin who has come to live with them being foxes rather than humans. 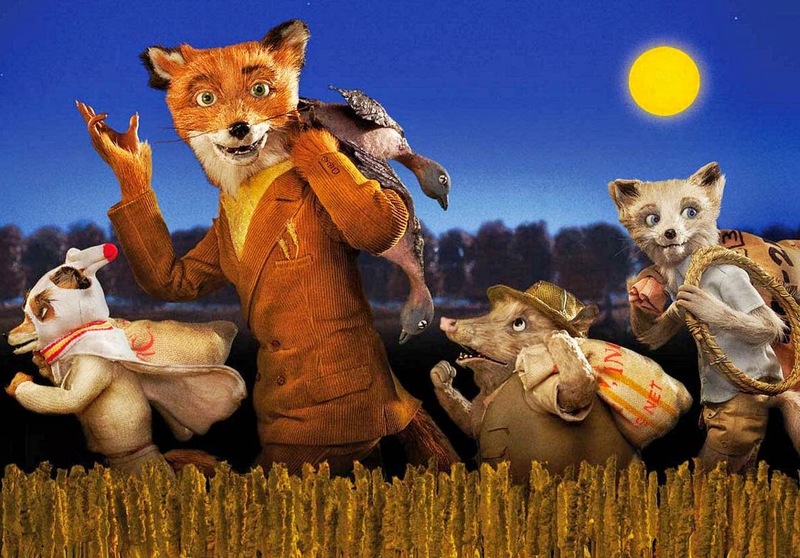 There's a really amusing surrealist spark to the inclusion of mundane family issues into this film, only for the foxes to wildly attack their food and remind you of what they are. On the other hand, the dryness of the dialogue and the somewhat drab aesthetic probably make this an animation that adults will enjoy more than kids do. The film is somewhat unique and stands alone. I find myself wondering what would have been different had Henry Selick stayed on this project rather than going to work on Coraline, but equally I'm glad both exist and have the fingerprints of their makers all over them. Fantastic Mr Fox is an oddity, and isn't necessarily one for the Dahl aficionados, but I find it rather an enjoyable companion piece.